To acquire, improve, and manage environmentally significant lands that protect water resources, wildlife habitats and natural areas suitable for resource-based recreation. Alachua County Forever will be a conscientious, innovative, progressive leader in land conservation and use acquisition, stewardship and funding development practices to preserve the environmental integrity of Alachua County and improve the quality of life for current and future generations. To be accountable to the taxpayers. To acquire the most environmentally significant habitats. To use a "No Loss of Conservation Values" stewardship ethic. To treat partners, landowners and sellers with respect. To leverage the County's local investment. To encourage a community land ethic. ​​ Alachua County and Alachua Conservation Trust (ACT) recently completed a joint acquisition that permanently protects important wildlife habitat in the Lochloosa Forest Project. The purchase of the 578 acres known as Fox Pen from Weyerhaeuser NR Company closed on January 15, 2019. The total purchase price was $1,321,177. 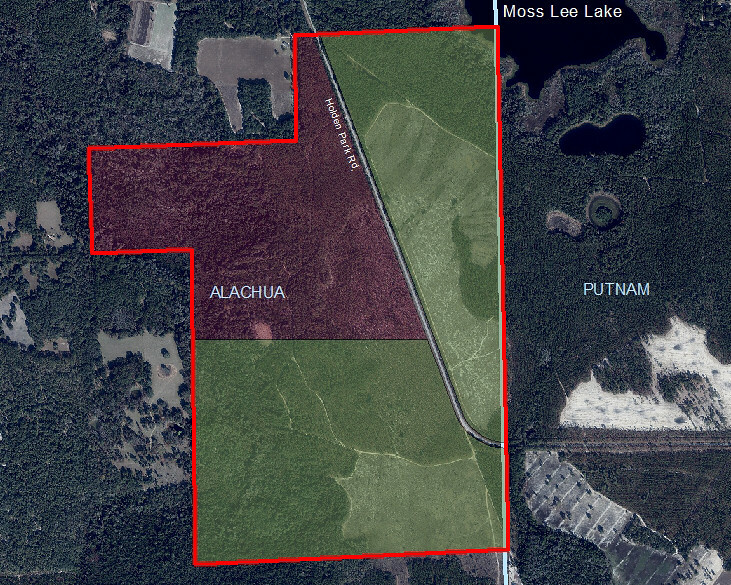 The 59,853-acre Lochloosa Forest Project Area is located in the eastern third of Alachua County. It extends southwards 27 miles from the Santa Fe River on the County’s northern boundary, to the Orange Creek Restoration Area in the southeastern corner of the County. It connects several existing state and local conservation areas. The acquisition of the Fox Pen tract will protect the outstanding waters and wildlife species diversity within the Orange Creek Basin. The property is a mix of sandhill, flatwoods, and mesic hammock. This land south of Hawthorne has longleaf pine, wiregrass, and other critical native plant species necessary for a thriving ecosystem. The yet named preserve will offer passive public recreation in addition to improving the water quality area and providing wildlife habitat. The County purchased 383.5 acres through the Alachua County Forever program with funding from the Wild Spaces and Public Places initiative. The County’s purchase price was $876,492. 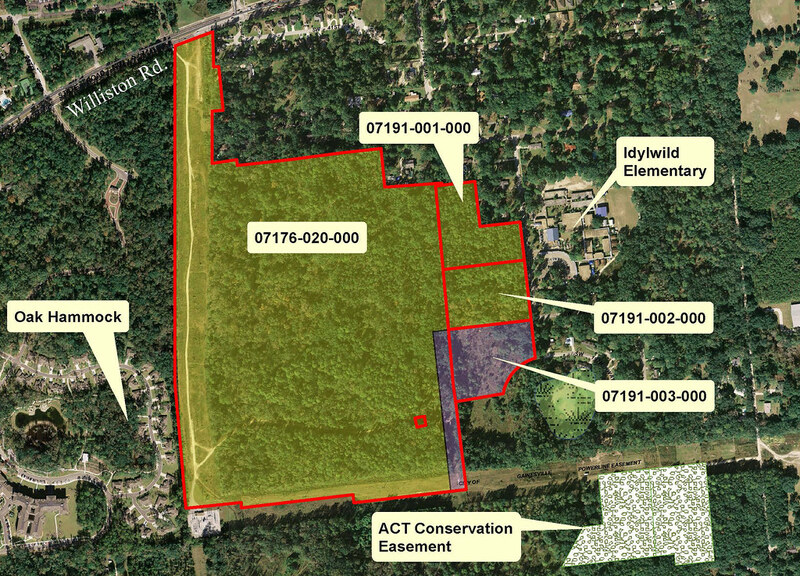 ACT contributed $444,685 in private funds to purchase 194.5 acres of the preserve and will provide day-to-day management for the entire property. Planned improvements include walking paths open to the public, two trailheads, bike racks, informational kiosks, benches, and a parking area. The preserve is slated to open in early 2020. The Wild Spaces and Public Places initiative levied an eight-year, one-half-cent sales tax approved by county voters in November 2016. Funds generated through Wild Spaces and Public Places pay for the purchase of conservation lands and the improvement of recreational facilities throughout the county and its municipalities. For more information, contact Alachua County Parks and Conservation Lands Director Charlie Houder at 352-264-6804 or email chouder@alachuacounty.us. Alachua County and Alachua Conservation Trust (ACT) are pleased to announce that an important buffer area between Paynes Prairie and Gainesville’s urban development has been permanently protected through this recent joint land acquisition. The long-negotiated purchase of 110.93 acres from Serenola LLC closed on December 6, 2018. Serenola Forest lies south of Williston Road between Oak Hammock and Idylwild Elementary School and consists of mixed pine and hardwood forestland. In addition to providing wildlife habitat in the urban fringe, this critical, buffering forest filters stormwater draining toward Paynes Prairie. The majority of the land, 103.21 acres, was purchased through the Alachua County Forever program with funding from the Wild Spaces and Public Places initiative. The County’s purchase price was $2,997,966. The previous owner, Serenola LLC, paid $18 million for the entire property in 2006. Alachua Conservation Trust (ACT) raised $225,000 in private funds to purchase 7.72 acres of the preserve and will provide day-to-day management for the entire property. Planned improvements include walking paths open to the public, two trailheads, wildlife viewing platform, bike racks, informational kiosks, benches, and a parking area. ACT has already coordinated a volunteer workday to remove debris from the site and another volunteer work day is slated for Saturday, December 29. For more information about Alachua County Trust, contact ACT Executive Director Tom Kay at 352-373-1078. For more information, contact Alachua County Parks and Conservation Lands Director Charlie Houder at 352-264-6804. ​ Alachua County and the City of Gainesville took ownership on Tuesday, September 25, 2018, of the Four Creeks Preserve, a 715-acre property that contributes to the flow of four separate creek systems. Rainfall on the undeveloped block of forestland situated between U.S. 441 and N.W. 43rd Avenue eventually finds its way into Turkey, Blues, Possum, and Hogtown creeks. Ownership by the City and County will help to ensure that these creeks continue to receive good quality water at their source. The property had been owned by a trust for Arthur D. Weiss of Boca Raton. It had once been slated for residential development, but was offered to the Alachua County Forever program by a local Realtor acting on the owner’s behalf. The passage of the Wild Spaces and Public Places funding initiative provided the impetus for the County to enter negotiations to purchase the property. The City of Gainesville had also identified the property for potential acquisition and was a ready partner to join the County in the purchase. When the final deal was struck, the City contributed $1.5 million for 245 acres along N.W. 43rd Street and adjoining its existing San Felasco Park. The majority of the City’s funding came from its tree mitigation fund. The County purchased the remaining 470.54 acres for $2,882,965.64. The County’s share came from the Wild Spaces and Public Places fund generated by the eight-year, one-half-cent sales tax passed by voters in 2016. 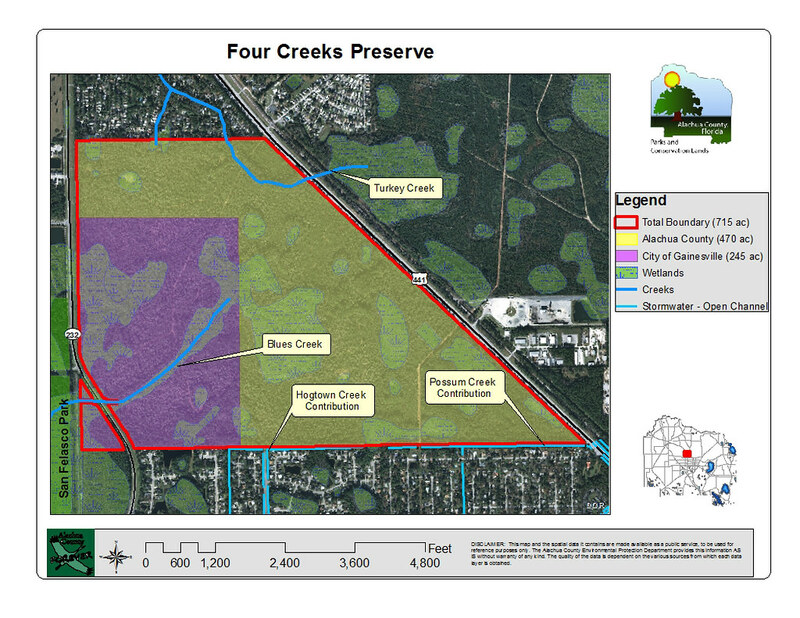 Four Creeks Preserve is the first Alachua County Forever project to use this funding. The program acquires and manages lands to protect their natural resource values and to provide for nature-based recreation. The property is predominately pine flatwoods interspersed with about 230 acres of wetlands. In addition to the ecological values on site, the tract form a part of a natural corridor on the north side of Gainesville. Staff from the City and County will coordinate on the management of their respective properties. Plans by the County include the development of parking, a trailhead, and trail system to be open to the public before October 2019. ​ Tuesday, April 10, 2018, is Gopher Tortoise Day in Alachua County and Florida. Gopher Tortoise Day highlights the importance of conserving this state-threatened species, whose presence goes back 60 million years. Gopher tortoises live in every county of Florida and are known for their extraordinary digging skills. These gray or brown tortoises use shovel-like forearms to carve out burrows averaging several yards deep and five yards long. Their burrows give shelter to more than 350 other native species. The County is encouraging the public to be aware of the gopher tortoise as a Florida keystone species and learn how their actions can strengthen recovery efforts. From now through May, for example, the gopher tortoise is increasingly active, leaving its underground burrow in search of spring greenery to eat and, in many cases, a mate. People can help by watching out for a tortoise crossing the highway and, if it’s safe to do so, picking it up and placing it on the roadside in the direction it was heading. It is important not to put this terrestrial animal in the water. 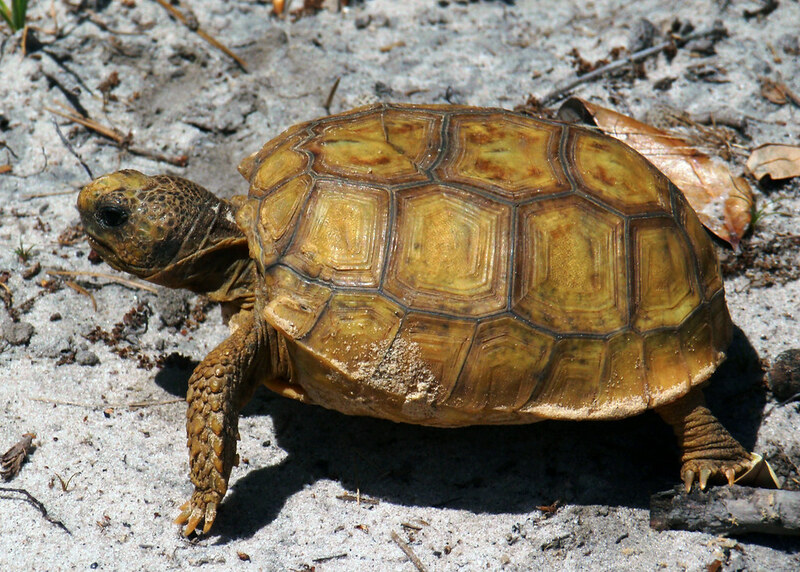 “Gopher tortoises are long living gentle creatures, and we often help concerned residents learn about them so they can successfully and happily coexist,” said Alachua County Environmental Protection Department Natural Resources Program Manager Stephen Hofstetter. The community can visit the many nature parks and preserves in Alachua County to see this incredible species. ​ ALACHUA COUNTY, FL - Alachua County is celebrating the public opening of the Southern Entrance to Barr Hammock Preserve on June 17, 2017, at 9 a.m. at the South Trailhead (300 S.E. 175th Avenue, Micanopy). The celebration will introduce the Preserve through a brief series of talks and a ceremonial vine cutting. Guided nature walks and a cycling tour will begin at 10 a.m. Bicycles able to traverse sand and mud, such as mountain bikes are strongly recommended for the cycling tour. Horse Trails open at 10:30 a.m.
After the celebration, the Preserve will be open for hiking, biking, and horseback riding on 13 miles of marked trails through a variety of forested ecosystems. This southern entrance brings the total trail mileage within the preserve to 19.5 miles of marked and maintained trails; the northern trailhead offers 6.5 miles of separate trails that do not currently connect to the trails accessible from the southern trailhead. Barr Hammock Preserve is located in south central Alachua County approximately one mile from the Alachua/Marion County line. It was acquired in phases between 2006 and 2016 with funding from the Alachua County Forever Bond, the 2008 Wild Spaces Public Places surtax, the North American Wetlands Conservation Act, Florida Communities Trust, the Southwest Florida Water Management District and a generous donation from the Whitehurst Family. The Conservation Trust for Florida partnered with Alachua County in securing funding for acquisition of the preserve and currently assists in management of Barr Hammock by conducting outreach to the community. “We are proud to have been a partner in protecting Barr Hammock’s critical ecosystems and consider it one of our biggest accomplishments,” said Conservation Trust for Florida President Lisa Gearena. Barr Hammock Preserve is managed by the Alachua County Parks and Conservation Lands Department as part of the Alachua County Forever Program (the voter-approved initiative to acquire, improve and manage environmentally significant lands to protect water resources, wildlife habitat and natural areas suitable for resource-based recreation). Barr Hammock is the largest Alachua County-owned Preserve at almost 6,000 acres. The preserve encompasses many ecosystems from dry forests such as sandhill to lowland hardwood forests and large expanses of scenic marshes. The natural communities of the site support at least 27 plant and animal species that are protected by the State of Florida. Partners in the stewardship of the preserve have included volunteers and donors include neighbors and interested citizens, student volunteers from the University of Florida’s Center for Leadership, the UF Chapter of the Wildlife Society, the UF Chapter of the Society of Civil Engineers, the Florida Trail Association, Gainesville’s geocaching group and Boy Scouts, donations of trees from Keep Alachua Beautiful, a donation of infrastructure materials from citizens Joel and Polly Smith, and a $10,000 grant from Weyerhaeuser toward preserve infrastructure. Staff has also worked with local artists to include interesting functional artwork as part of the preserve infrastructure. For more information, contact the Alachua County Parks and Conservation Lands Department at 352-264-6868 or @alachuacounty.us@alachuacounty.us. To view all other news for Alachua County Land Conservation Click Here.